Even in his dying moments, his only thoughts were for the climber whom he advised to descend Mount Kinabalu as fast as possible. The 31-year-old, who was bleeding profusely, had also indicated to the person that he wanted to help others who might be on their way down the steep slope. An Amazing Borneo employee, Lynn Tiang, who related Sapinggi’s last moments after hearing accounts from witnesses, said the veteran guide and the climber were well on their way down when the earthquake struck and he was hit by falling rocks. “Despite being hit, he instructed the climber to descend first, prioritising the person’s safety before his,” she added. She said she was told that Sapinggi had wanted to wait for a rescue team and not attempt a descent on his own. Sapinggi, from Kampung Kiau, Ranau, is believed to have waited for about five hours before deciding to slide down the rocky slope. “When the rescue team found him, he was barely alive. He died moments later,” she added. Sapinggi’s heroic exploits that fateful day when he proved himself a friend to all who climbed the famed mountain have gone viral on the Amazing Borneo Facebook page with 26,400 ‘likes’ and 5,800 shares since the 7.15am incident on Friday. Many described the Kadazan-Dusun as one who always put the safety and interests of others before his in the 11 years he had been scaling the highest peak in Southeast Asia, first as an assistant and in the past two years as a licensed guide. The page featured a photograph of Sapinggi besides briefly explaining how he died on the mountain that he loved. Some were taken up by Sapinggi’s cheerful personality and his caring nature that sometimes extended to unimaginable extents. For instance, Loh Hong Siang commented that Sapinggi had held her hand for the entire eight-hour hike from Laban Rata to the peak. Rachelle Rajamah said the guide had once given his gloves to her when hers were wet to make sure she was comfortable on the journey up. A few said that his spirit exemplified that of the group of guides who took the job of assisting climbers up and brought down the mountain seriously. Sapinggi, who leaves behind a wife and six-month-old son, was himself an avid traveler like many of those he guided up the sacred mountain. His Facebook page featured photographs of him at the Serengiti National Park, Tanzania, besides his holidays to many parts of Australia. 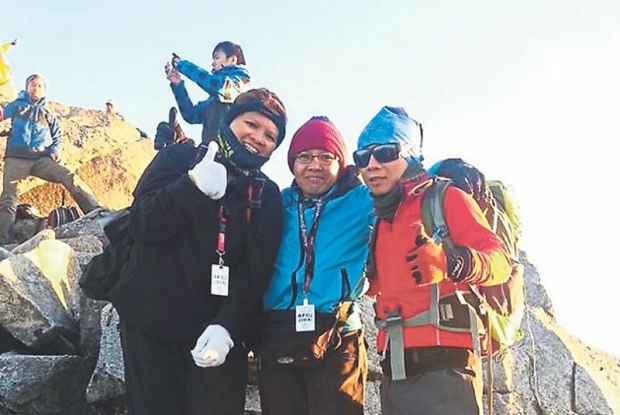 Sapinggi poses with two climbers on Mount Kinabalu in early April. He died moments after a rescue team found him on Friday.